Mercurial barometers were invented in the 1640s, but those made earlier than about 1740 are rare indeed. Most of the ones we sell date from the late 18th to the mid 19th century: they are old enough to be desirable antiques but not so old as to be quite rare and costly. 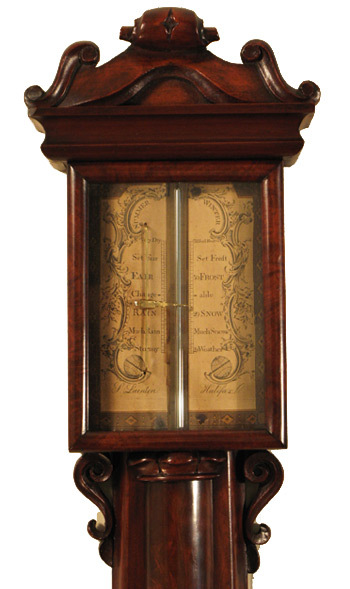 Our antique barometers are all in working order and in superb condition. 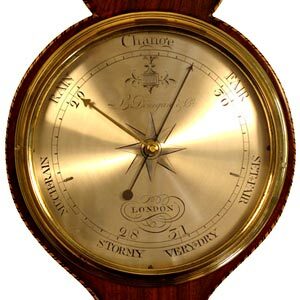 Any restoration that has been done has been performed correctly, and the cornices, hands, verniers, thermometers and mercury systems are exactly as they should be for the age and type of barometer. We are happy to deliver the barometers if time and distance allow. Barometers come and go. If you are looking for a specific type, call or e-mail us and we'll put you on our list. Common household stick barometers made with a fixed internal cistern size deliver readings with a small error due to an imbalance between cistern and tube volume. This imbalance affects readings exponentially as pressure reaches the extremes of the range, high and low. This had been a known problem for scientists since the late 17th century and several methods of implementing an adjustable cistern were tried over time, resulting finally in Nicholas Fortin's invention of the cistern system bearing his name in about 1800. Fortin's cistern was and still is used in most scientific mercury barometers. Another scheme for adjusting, or "zeroing", cistern volume was developed by either Jesse Ramsden or George Adams in about 1770 (there is debate in the journals of the day for credit), using a gauge that incorporated a small plunger which floated from the surface of the mercury in the cistern. 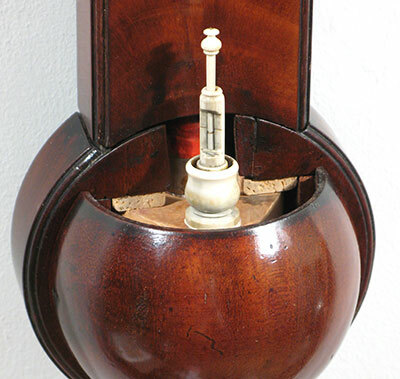 The fixed gauge and its movable plunger have an index that can be brought into line by using the "portable screw" in the base of the barometer to push up or lower the leather diaphragm of the boxwood cistern to change the level of the mercury in the cistern, thus keeping cistern volume in step with that of the tube. This system does not adjust for elevation; its intent is just to correct the reading for volume. 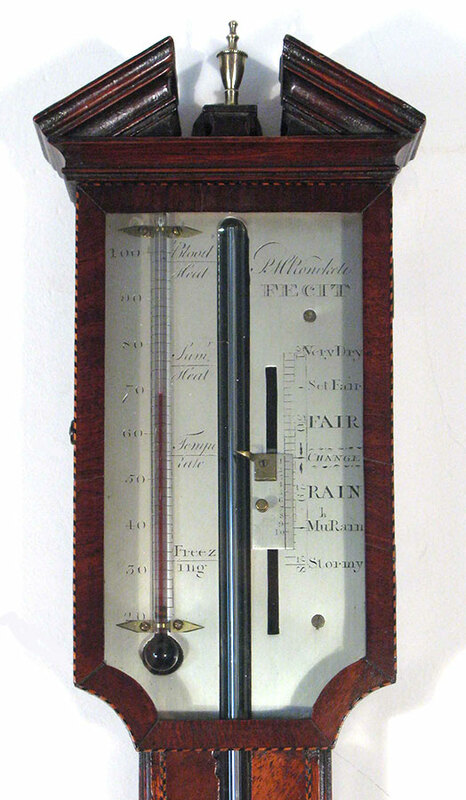 This barometer was produced by Negretti and Zambra (1850-present day) at their first address of 11 Hatton Garden, London, between 1850 and 1859. 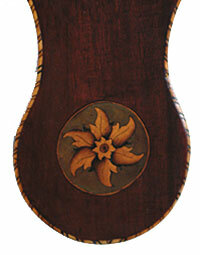 The scales are engraved and the fine case is mahogany, with an old and very good finish. The original cistern and float system are still in place, and only the set knob is replaced. There is some minor restoration inside the cistern area, not visible when the cover is in place. The glass tube has a very large bore, common in scientific barometers to reduce the arc of the meniscus, and the tube seems to be original as well. It holds a large volume of mercury. The quality of the case and fittings are very high overall and the condition is excellent. Inlaid mother of pearl decoration has been used around the world for centuries, and became very fashionable in English furniture and accessories at about the 1850s. Furniture and wood objects of all kinds were decorated with naturalistic motifs, usually birds and flowers. 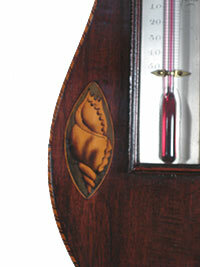 Barometers too were inlaid with the material, most often on a rosewood or ebonized (black) field. This is a nice example of the art in a marine barometer, veneered with rosewood and inlaid with mother of pearl, brass wire and shaped brass panels. The register and thermometer plates are engraved, in very good condition; clean, clear and readable. The gimbal is a correct replacement for the original, with replaced twin set keys of bone. The finish is old, with a recent clean and wax. The mercury cistern is correct for a marine instrument and old, with a correctly replaced marine mercury tube. There is a very similar marine barometer by William Mowbray in the collection of the Maritime Museum in Kronborg, Denmark. William Mowbray practiced as a clockmaker in the Durham seaport of Hartlepool from at least 1841 to 1871. This barometer is about 1860 in date. With thanks to Mr. David Mowbray for genealogical information on this maker. M. della Torre, Warrington, Lancashire. The inlaid conch shell and flower motifs were popular in English dial barometers from about 1805 to 1830. This example was made about 1820-1825 and the silvered brass dial is marked with the maker's name and town. There is some minor replacement in the decorative stringing around the case and the finish has been repolished. The brass finial is a replacement. The de la Torre family (usually listed "della Torre) of instrument makers is recorded throughout England from 1760 to the 20th century. 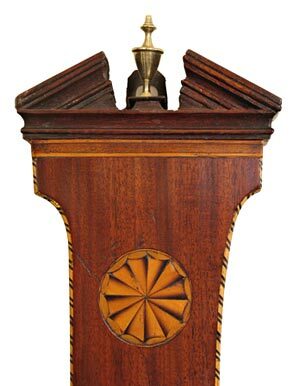 This is a mahogany-veneered dial barometer with eight inch dial, about 1825-1830 in date. The maker is (was) James Tognietti, who practiced in Plymouth, England from approximately 1800 to 1830. Old written listings of makers and their dates aren't always birth-death precise and are sometimes taken from old business directories; other times are just someone's guess. 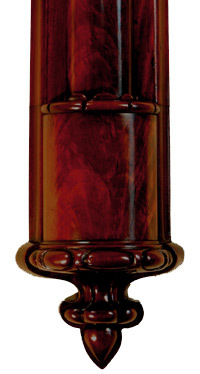 In this barometer, the case characteristics and the dial engraving support the 1825-1830 date. The stringing on the case is a continuous black/white line around the perimeter, and the mahogany has gone to a very pretty amber color. The condition is just about immaculate, and the restoration is limited to just some replacement in the stringing, a recent polish of the finish, and the brass finial is a correct replacement. The mahogany case is nearly immaculate and required almost no work beyond cleaning and going over the old finish with a new polish. Very pretty barometer. The inlays still have some of their green tint, a color that is often completely gone. 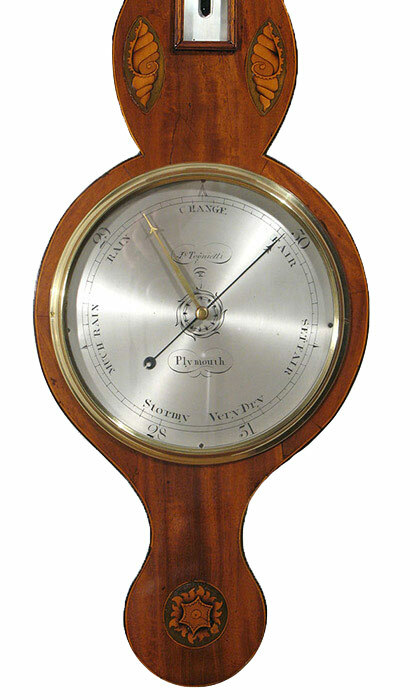 This is an American-made ship's barometer, rather than an English import signed by an American seller. The case is rosewood veneered over poplar, probably sourced from a casemaker further south, likely New York. The scales are engraved and the "CHANGE" weather indication is in a format usually limited to American barometers. The Fahrenheit thermometer is also on a plate, and the temperature indications are limited to just Freezing at 32 degrees, also typical of American marine barometers. The original condition of the barometer is well preserved - the finish is very old and probably original, being quite worn in places. The case is sound and with minimal evidence of any repair. The scales are all intact and readable with little or no staining. The mercury system has a very old ship's style cistern, possibly an original, and an incorrect replacement mercury tube has now been replaced with a proper marine tube. The brass mounting gimbal is an old reproduction, not the original. Conservation/restoration is limited to cleaning and waxing the case, cleaning the brass, and replacing the mercury tube. The instrument is fully functional. John Hayden (1808-approx. 1892), born in the US, was a descendant of Scottish immigrants, and spent most of his adult life as owner of a jewelry business in Bath. He married Martha Ann Brown in 1831. Hayden served as a state representative in 1850, 1863, and 1865, and was elected mayor of Bath in 1866. Watches signed by him are known; one is now in the collection of the Maine State Museum. It was not unusual for jewelers to sell "instruments of an optical nature", and a ship's barometer sold in the heart of the ship building area of Maine would certainly be stock in trade for Mr. Hayden. There are probably other clocks, watches, and instruments out there with his name on them, although it is unlikely he actually manufactured any of them. 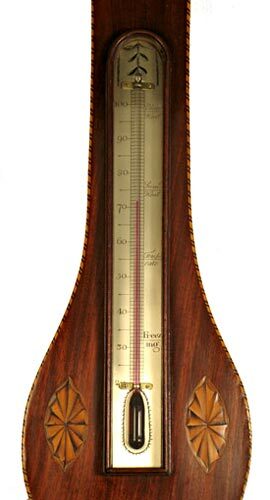 Spectacular 19th century Dutch inlaid walnut contra-barometer, so named for one of its two mercury systems which uses a U-shaped tube with mercury and colored oil, essentially an expanded scale for easier reading of small movements. Contra-barometers, also known as bak-barometers (literally, barometer in a box, for the rectangular glass-fronted case), are found throughout the Low Countries from about 1740 onwards. Weather indications on the polished pewter plates are Orcaan (hurricane), Hevige Storm (severe storm), Storm, Veel Reg. of Wind (region of much rain and wind), Regen of Wind (rain or wind), Veranderlyk (changeable, or variable), Goed Weer (good weather), Mooy Weer (beautiful weather), Bestendig (settled), and Heel Schoon (perfect weather). 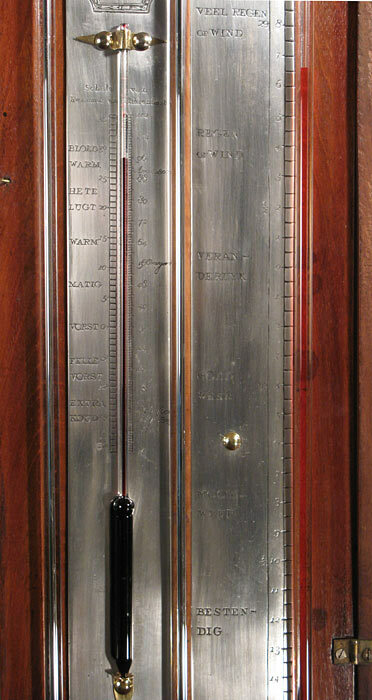 The main weather scale, read off the top of the red oil in the far right tube of the instrument, has its major markings in English inches, from 28 to 31, each inch with 12 divisions. This scale has a central point, marked “0” (zero) at just above 29.5 English inches, a designation of mean barometric pressure at sea level in the Netherlands. The scale traverses 36 divisions in total and is known in the Netherlands as the “36 Scale.” The central barometer tube has Rhineland (French) inches on the right side and English inches on the left. The spirit thermometer notes record high and low temperatures in Amsterdam at 1740, 1802 and 1823, and also has indications for Extra Koud up through Bloed Warm. Fifty-six degrees on the Reaumur scale is indicated as the optimum temperature for an orangerie. The maker is J Stoppani & Zoon (Son), Amsterdam. Various spellings of the last name are found on barometers in both England and the Netherlands, as is common with the Italian immigrant instrument makers who moved into northern Europe in the late 18th century. This is possibly John Stoppani (Stopanni, Stopani) who was also known to have been working in Aberdeen from 1824-1860. The barometer has restorations to the case (top finial, one bottom finial, various veneer and inlay repairs) and a recently polished finish. The case is complete and in sound and attractive condition. This is a fine example of a late Georgian stick barometer by a noted London maker. The sweeping scroll cornice, long register plate, stepped cistern cover, and lack of a thermometer point to a date of just around 1800, supported by the fine and simple engraving. The case uses solid ebony mouldings and stringing on the cornice, around the register plate area, and down the front of the case. Figured mahogany veneer sets off the front of the case. Altogether a very elegant and understated example. There are minor restorations to the cornice mouldings and the old finish has been repolished. William and Samuel Jones practiced in the Holborn Hill area of London from about 1787, when their father John died and left them the business, until about 1805, and later in the High Holborn area. They were very technically accomplished, William in his younger years having worked for both Benjamin Martin and George Adams. This instrument was probably made in the 1794-1805 period of their practice. 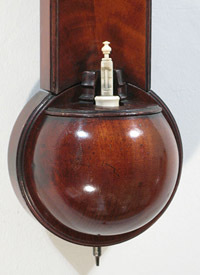 George III period dial barometer by L Donegan & Co., London. 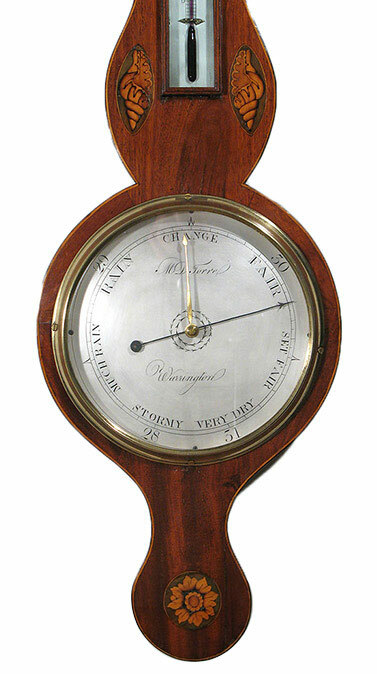 This early dial barometer is beautifully made, with the short shoulders below the cornice and the wide, graceful curve of the case next to the thermometer box that mark it as Georgian. The four inlays are of the fan style rather than the later shell and flowers form, and the case is outlined with checkered stringing of boxwood and ebony. Sides are crossbanded. 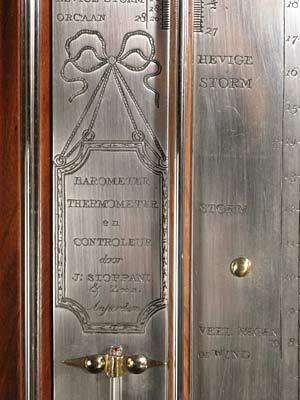 The thermometer plate is graduated in the Fahrenheit scale and decorated with foliage engraving at the top. The weather dial is finely engraved with a large compass star in the center. There is some minor restoration to the stringing and the finish has been repolished. L. Donegan & Co. are listed by Banfield as practicing at No. 3 Long Lane in London from roughly 1815 to 1835. This barometer is a few years earlier than those dates, probably about 1810. This is a somewhat unusual form of dial barometer, and one which London makers produced in both eight and ten inch sizes. It uses an architectural cornice rather than the more usual scroll or swan neck, and conch shell inlays either side of the thermometer. It is very nicely made with some unusual touches such as the stringing around the thermometer box and has the good and graceful lines of the earlier dial barometers. The dial center is engraved with a handsome compass star. The brass finial and some minor cornice moulding work are the only restorations. The level plate is signed Chs Ganna, 19 Dean St., Holborn. Charles Ganna is not listed in the usual dictionaries of instrument and clock makers, but the work in the barometer is in the same league as the high-quality Somalvico or Dollond workshops at this period. Samuel Lainton is well known to barometer collectors for his angle barometers. This stick is in a similar vein, using a large mahogany case with exuberant carving and printed paper register plates. Both case and plates are very original and in excellent condition. The finish is old and well preserved. There are no restorations beyond a cleaning and wax on the finish. Samuel Lainton practiced in Halifax from approximately 1820 to 1850. Charles Howorth, of the same city, made nearly identical barometers in the same period. It is not known who the principal manufacturer of the two was, and it does not appear that they were in partnership. Makers working in England’s late Georgian Period produced some of the most elegant barometers of any time. Forms are clean and graceful, and handsome decorative inlays and stringing were used. This is one such example made by J M Roncketi of London. The glazed door over the silvered register plate is shaped at the lower edge to merge smoothly with the slim trunk of the case, and alternating boxwood and ebony stringing surrounds the door and runs in a double line down the sides of the trunk. The color is nicely mellowed to a soft brown. The cistern cover is original and there are no major repairs or replacements. John Merry Roncketi (Ronchetti, Ronketti, etc; engravers had a hard time with his name) worked at 180 Holborn from 1787 to 1797. An Italian immigrant, he was known for making a large number of very fine stick and wheel barometers. This is one of the first of the “Sheraton Shell” barometers, with the conch shell and flower inlays that were just coming into fashion. 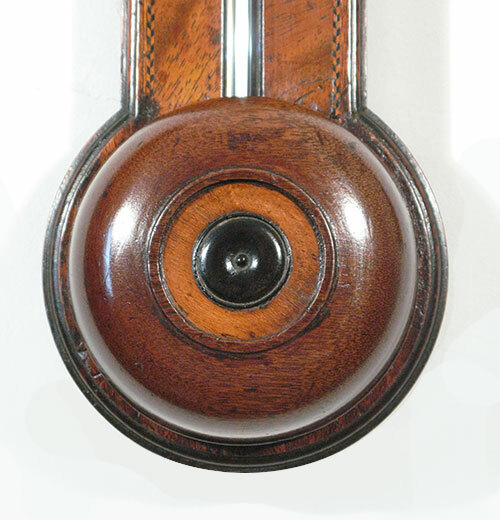 It has the late 18th century form of case, with the short shoulders below the cornice, crossbanded sides, checkered stringing, and the wide, graceful curve of the case through the thermometer section. The thermometer plate is graduated in the Fahrenheit scale and decorated with foliage engraving at the top. The weather dial is engraved with the weather indications at the outer perimeter, a convention that changed in the next few years. The finish is old and in very good condition, and there has been some minor restoration to the stringing and the cornice mouldings. Banfield lists Joseph Gafurio as practicing in the city of Chester from 1810 to 1830. Instruments are known signed both Joseph Gafurio, as this one is, and Gafurio and Company. Spencer, Browning & Co. is one of the most recognized names in the 19th century production of instruments in general, and barometers in particular. This is a good and clean example, with a mahogany case and brass frames for the register plates and thermometer. Register and thermometer plates are engraved. The thermometer is graduated in Fahrenheit and centigrade, with Fever Heat marked at 113 degrees! The gimbal is an old and correct replacement for the original. The finish is old, with a recent clean and wax. The brass frames for the glazing are original and in good condition, and the plates are in very good condition; clean, clear and readable. The set knob and mercury thermometer also appear to be original. The mercury cistern is correct for a marine instrument and old, with a correctly replaced marine mercury tube. William Spencer and Samuel Browning founded the firm known as Spencer & Browning in 1781, and in 1784 were joined by Ebenezer Rust, at which time the company was renamed Spencer, Browning and Rust. They continued under this name until Rust's death in 1840, then again renamed the firm Spencer Browning & Co., and terminated about 1873. This barometer was made about 1850. Please contact us if you're looking for a particular type of barometer. has been moved HERE. No need to download photos that don't particularly interest you! We also do not offer appraisal services. However, we will resume taking in barometers for restoration later in 2016.